First patented in the mid-1800s, this durable flooring can still be found in kitchens, bathrooms, mudrooms, and foyers more than a century later. Find out what makes linoleum so desirable. Think linoleum and vinyl flooring are one and the same? Think again. While many people mistakenly call vinyl tile ‘linoleum’, the two couldn’t be more different. 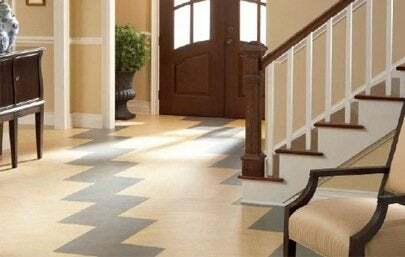 Unlike vinyl tile—a floor covering developed in the 1930s from chips of a synthetic resin called polyvinyl chloride (PVC)—linoleum boasts a more-natural makeup that has been in production even longer. Patented in the 1860s, it’s made with renewable materials including linseed oil (also called linoxyn), tree resins, recycled wood flour, cork dust, and mineral pigments, all of which mounted on a jute or canvas backing. To understand how this material remains a viable flooring option in homes for centuries, get to know linoleum flooring’s history and best features. Despite its affordable price point, linoleum was considered a luxurious material for many years—it was actually used in the Grand Ballroom, the dining room, and other areas of the Titanic! But gradually cheaper vinyl flooring overtook linoleum in the 1940s. While vinyl is more economical and easy to maintain, it’s simply a printed design with a protective layer on top. Once that protective layer wears down or is damaged, the flooring must be replaced. The benefits associated with linoleum flooring, on the other hand, ran deeper. Here are five key reasons homeowners choose linoleum. Durability: Most manufacturers back linoleum flooring with warranties of 25 years or more, but proper care and maintenance can extend the product’s lifespan up to 40 years—more than double the expected lifespan of vinyl flooring. Some of the product’s longevity is due to its inherent colorfast construction: The color and pattern are throughout the entire width of the material, not just printed on the surface (as it is in tile). Just make sure that you’re outfit homes with linoleum flooring that includes a protective coating added by manufacturers to prevent the surface from darkening or taking on a yellow tinge (a process called “ambering”), especially when exposed to direct sunlight—it’s not necessarily included with every linoleum flooring option. This protective top layer reinforces the material’s resilience against dirt and scuffs, but linoleum is not altogether impervious. Still avoid damage like dents and tears by sharp objects, including high heels, metal furniture legs, and dropped knives. Water resistance: Beyond rigidity that holds up under the normal wear and tear of foot traffic, linoleum features a basic water resistance that you won’t find in flooring options like wood. This advantage makes it an intelligent choice for spaces that welcome wet shoes and snow-covered boots from the outdoors as well as those that see splashes, like kitchens or bathrooms. Linoleum floors should never be immersed in water, however, because excessive moisture can cause the edges, corners, or seams to curl. Floods, burst pipes, and even high humidity can do damage. For a more waterproof option, research comparable vinyl tile options instead. Easy maintenance: Linoleum is one of the easiest flooring materials to clean and maintain. While its protective top layer wards off dirt and scuffs, you’ll still need to clean it regularly with mild, non-ammonia-based cleansers. A quick sweep or vacuum periodically will remove the abrasive dirt particles that could scratch up linoleum over time, as would an occasional damp mopping with warm water. Stains can be easily removed with a rag and mild detergent. Since the color in linoleum runs all the way through the material, if it does get stained or scratched, you can buff out the damage and refinish your floor. Linoleum that is not factory-coated to protect against ambering will also need to be cleaned and waxed every two or three years to prevent yellowing and also to protect the surface from scratches and water damage. Eco-friendliness: The name linoleum reflects the product’s all-natural roots, coming from the Latin words “linum,” meaning flax or linen, and “oleum,” meaning oil. Linoleum is also easily recycled and biodegradable. Thanks to its wood components, after 25 to 40 years you can toss the material out guilt-free—take the used linoleum to an energy-recycling incineration plant or, if the discard pile is small enough, even compost it for your garden as you might do with mulch or wood chips. And its all-natural composition ensures that it does not emit any harmful VOC (volatile organic compounds) emissions, to boot! Myriad options: Today’s linoleum comes in an enormous variety of colors, styles, and patterns, including designs that mimic the look of wood, stone, or marble. Linoleum’s appearance isn’t the only decision to be made, though; it’s available in a number of options for installation and overall looks, too. • Sheet linoleum flooring offers the largest variety of colors and patterns and comes in jumbo-sized rolls that are suitable for covering large, open areas. • Tile linoleum flooring is similar to ceramic, porcelain, and stone tiles but much less expensive. 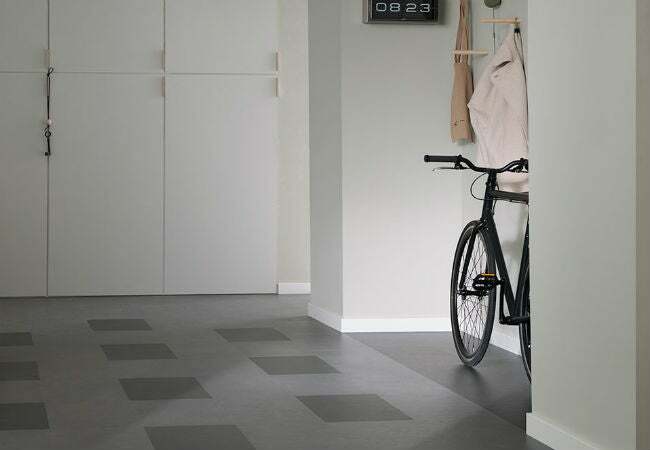 • Click-and-lock linoleum is designed to be used as part of a floating floor system and comes in tiles or planks. Sheet and tile linoleum is typically glued in place, while click-and-lock flooring snaps into place on a floor frame and therefore does not require any additional adhesive. 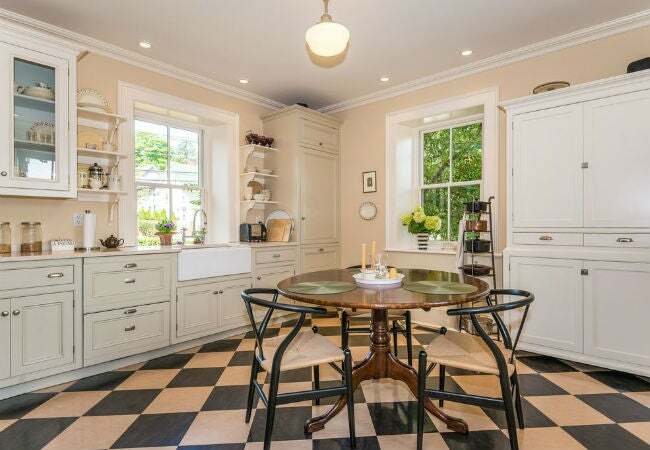 Updating the kitchen floors with linoleum can be a do-it-yourself project, particularly if you’ve gone the route of tiles, which often come in a “snap-together” configuration designed to be installed as part of a floating floor system. For sheet linoleum, however, you might be better off calling in a professional flooring contractor—this variety of linoleum flooring is much stiffer than sheet vinyl and can be difficult to measure, cut, and fit accurately. If you’re hiring out, be sure to budget for labor when planning your remodel. The cost for installation typically ranges from $716 to $2,068, with the national average at $1,378, according to Home Advisor’s True Cost Guide. • Make sure the underlying floor is level. • Remove any old flooring material, staples, tack strips, nails, or debris. • Have a properly-installed subfloor. • Maintain a gap of at least 3/8-inch between the subfloor and the top of the baseboards to allow for natural expansion and contraction of the linoleum floor. Linoleum is an extremely cost-effective flooring option, especially when compared to hard surface flooring such as hardwood, ceramic, or stone. Average prices for linoleum typically run in the neighborhood of $2.50 to $3.50 per square foot—that’s slightly more than vinyl flooring, which can start as low as $.50 per square foot and go as high as $5 or even $8 per square foot for the newer, luxury vinyl alternatives. Meanwhile, hardwood may cost you between $5 and $15 per square foot, ceramic tiles between $5 and $15, and stone tiles between $7 and $20 per square foot, according to Home Advisor’s Flooring Costs Overview. If linoleum flooring’s pros outweigh its cons for you, start researching your options with the one company now selling the majority of the linoleum for residential use here in the U.S.: Forbo Marmoleum. (Armstrong Marmorette had been recently discontinued, and now recommends comparable vinyl products for those flooring options no longer in production.) 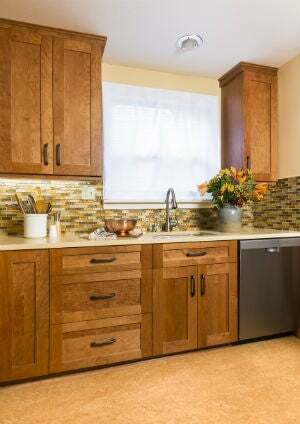 Its linoleum comes in sheets or tile form, in a wide variety of colors that can look just as great in a Craftsman-style home as a super modern one. Kitchen, bathrooms, entryways, and mudrooms could all benefit from the easy-care, quality material.